After finishing third in the Unlimited FF class of the Super Lap Battle in Buttonwillow the 5Zigen guys sent their Accord Euro-R back to Japan in time to compete at Tsukuba. 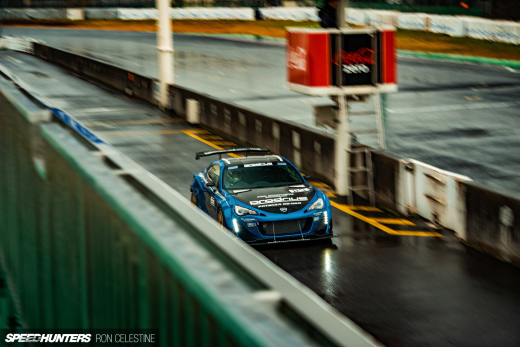 The car arrived back at the Osaka HQ on the first of December which allowed them to get to work on it to take care of a few small modifications before its outing at the Rev Speed event. It’s the first time I’ve seen the car so I took my time to have a nice detailed look over it. I remember test-driving the CL7 Euro-R back when it first came out in Japan and really though it was a great car. I remember blasting around the mountain area north of Hitachi in Ibaraki-ken and then driving it all the way to Hakone for a shoot and still managing to return very good mileage. A true all rounder. Mind you, the 5Zigen Accord isn’t really anything like the street car, but more like an outright race car built without following any regulations. 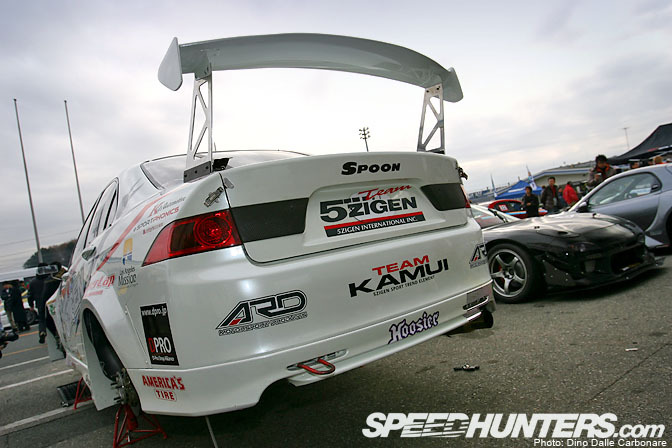 5Zigen has always been involved in professional racing and that really shows on the Accord. Take a look at that hood-mounted wing for example. 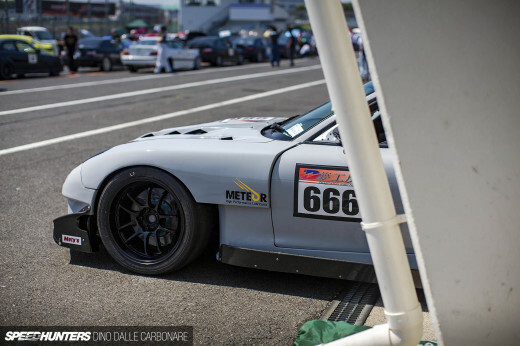 They call it the “Devil Wing” and it’s supposed to help keep the front end planted around the corner helping those poor front tires not only steer the car, but also put down all the power the turbocharged engine develops! Brembo Racing magnesium alloy calipers are fitted at all four corners, 4-pots up front and 2-pots at the rear. Like other cars that have competed at US Time Attack events, 5Zigen needed to ditch the close to slick rubber, in their case Hosier, in favor of semi-slick tires. 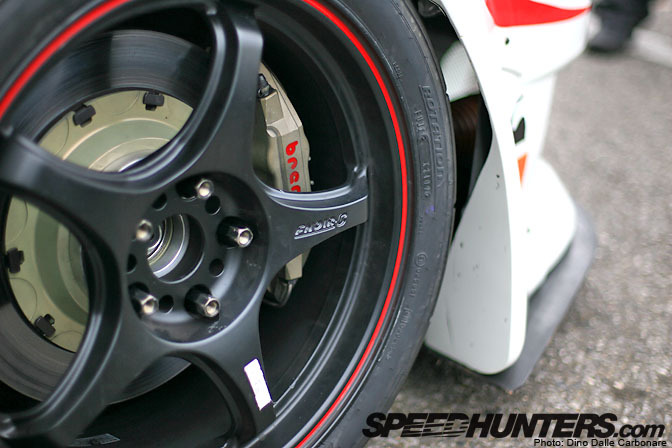 Here are the Dunlop Direzza 03G they were using mounted to 5Zigen FN01R-C wheels. The little front mounted intercooler kind of hints at what sort of route was taken to get some additional horses out of Honda’s high-revving 4-cylinder motor. 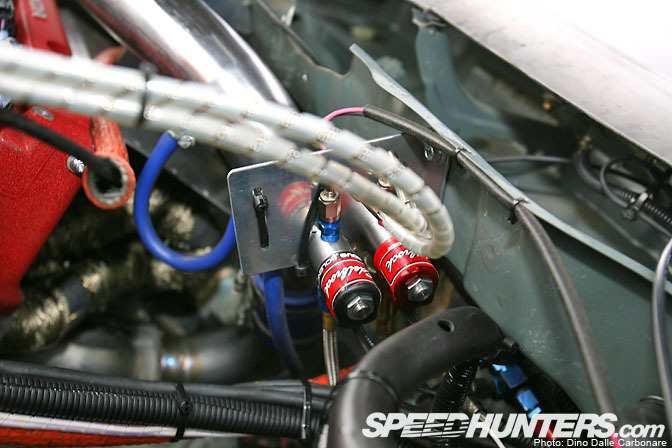 …and if that wasn’t enough it’s mated to a nitrous oxide injection system, there to boost the lower rpm range. 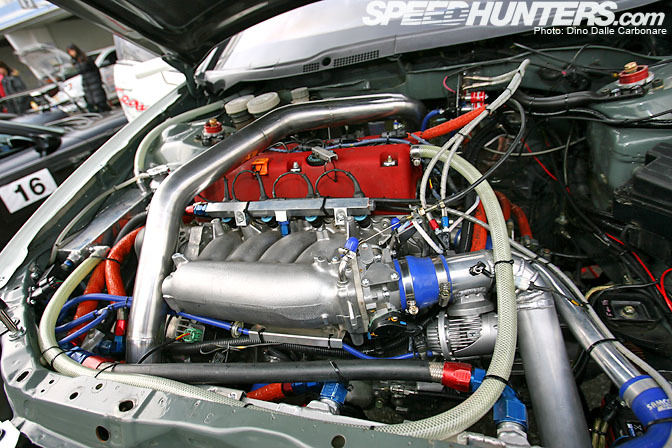 The guys at 5Zigen Japan reckon this puts out around 420 HP, giving those Dunlops quite the workout. Out on track the Accord managed a best time of 1’00″428, which is not bad considering this is the turbo car’s first outing at Tsukuba. Everything not needed has pretty much been eliminated, like the front headlights, sealed off with carbon fiber and a round air intake on the passenger side. I was very impressed with the multi-function LCD dash unit, beautifully encased in the carbon fiber instrument binnacle. 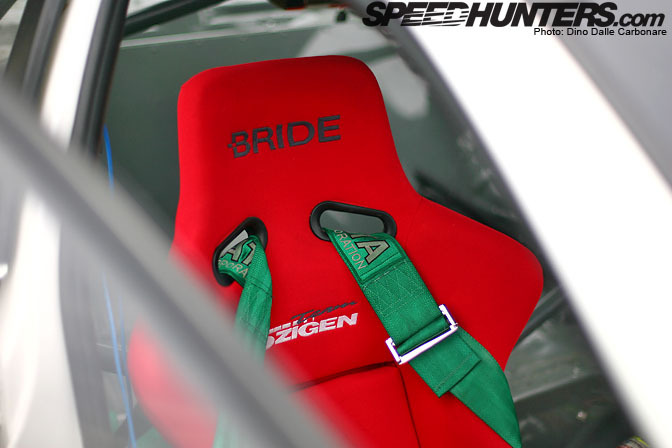 This car has been stripped down to the bare essentials, which is why inside you will only find the driver’s Bride bucket seat with a set of Takata harnesses. 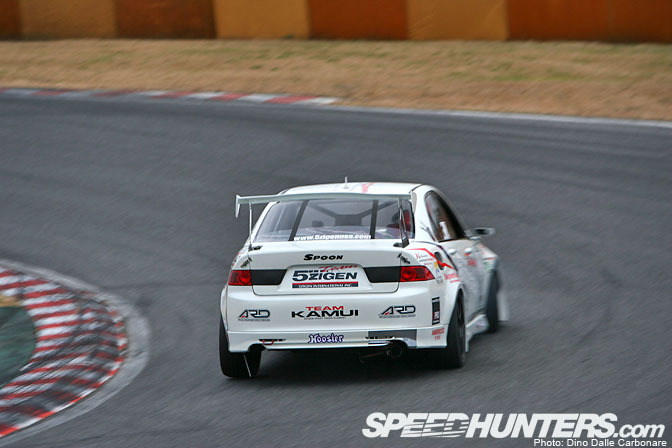 Would be cool to see the car compete at more Tsukuba time attack events, at least until it manages to achieve a sub-minute lap time. You can probably expect to see this car at the Tokyo Auto Salon in about a month, showing off that crazy Devil Wing and its boosted K20. Love this Accord!! Makes me want a TSX right now. Hey Dino, what's the fastest FF car at Tsukuba and what was its lap time? I dig this car and feature. More FF! This model Accord makes the current model look a little ugly. To bad honda stopped with the Euro R's. 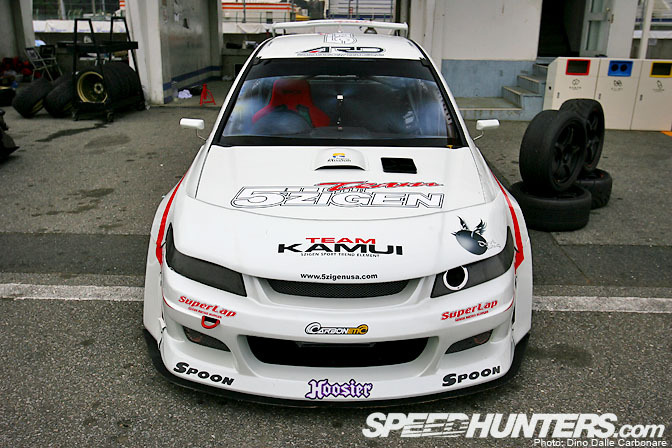 FYI... this car finished 3rd in the "Super Lap Battle" final, and 2nd at the "Redline Time Attack" final. "Redline Super Lap Battle" does not exist. Go 5zigen ! too many horsepowers for fwd tho. @ tobor, tell that to ford with the focus RS. They got it done, and it seems to work pretty well. Awesome CL7 always liked the accord and especially since its recently been facelifted. 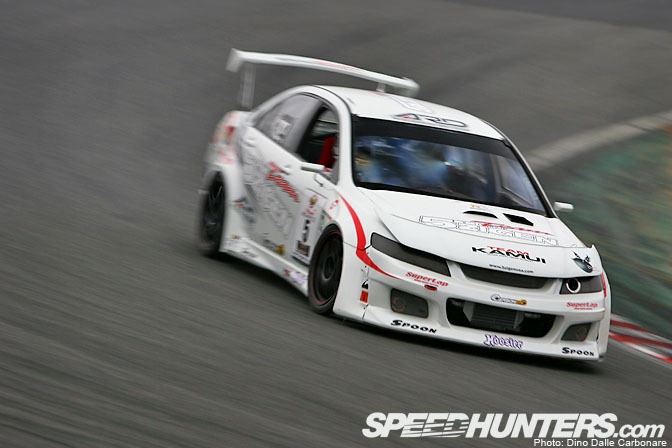 I like this accord and the real time racing tsx as well. But 420hp out of a K20 mounted transversely is quite an achievement especially since everybody knows the maximum you can get out of a FWD car is 250hp before loss of traction and serious understeer. tobor, don't tell that to Rado! Thanks for posting this, Dino. I love me some FF action! 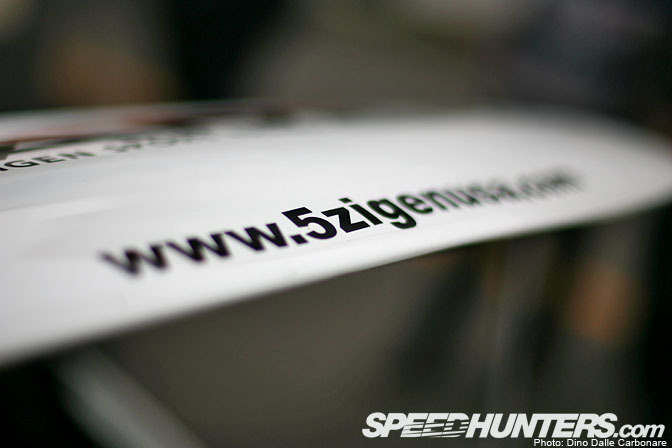 Interesting that 5Zigen is running that Devil Wing along with a fairly small front splitter. I wish more of the Japanese tuners were willing/able to bring their TA cars over here like 5Zigen seems to do every year. 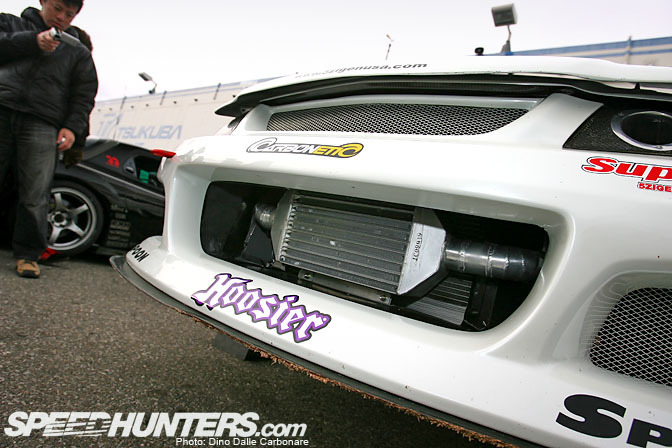 I wonder when the top U.S. TA teams will start doing the same and head over for the Rev Speed event at Tsukuba? I'd love to see how Rado, FXMD, GST, Crawford, AMS, Sierra Sierra and the like would do over there. 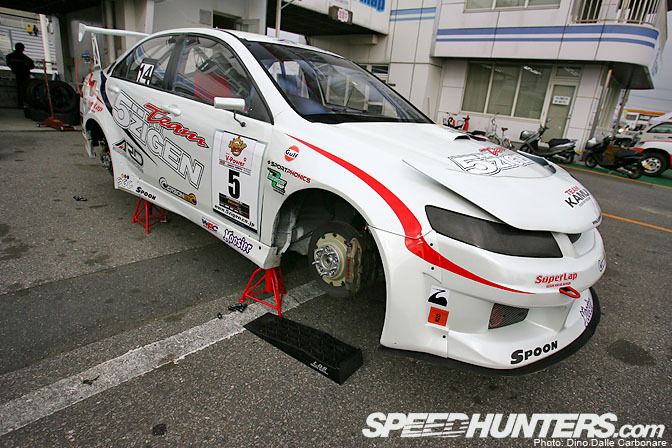 BTW Dino, I think you've hit on a good business plan: time for you to start the Japan Time Attack series! 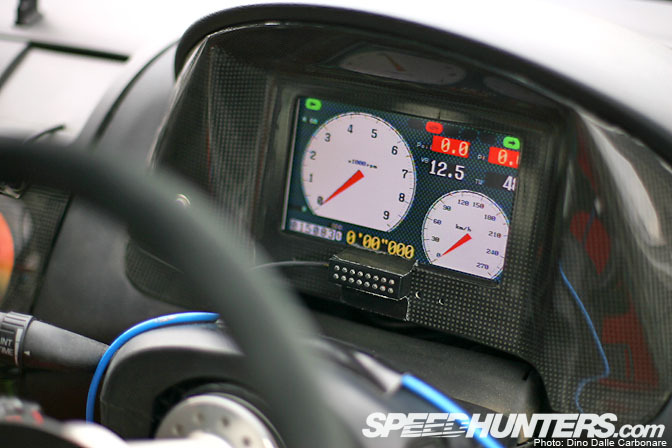 The LCD instrument cluster also looks very nice! What ever happened to their Civic type R? Ditto on the SWEET!! Too bad the accord in america is a Giant whale. Yes the TSX is there to fill the void but it just doesnt quite fill it. Remember how easy it was to spin the front wheel of a Big Wheel from a standstill? Or how you always understeered when trying to turn? The front end looks serious with that 'Devil WIng'. 1st seen here for me. people underestimate the sheer power of a nicely tuned honda. I bet the wtcc Accord built by N-technology could keep up with it, despite being down by over 120hp.